There is no doubt that Holland Lops are challenging to breed. Among the challenges–slow maturation, wide variety of quality in resulting kits, multiple characteristics to manipulate–is the dwarf gene. The following information on the dwarf gene applies to other types of dwarf rabbits as well as Holland Lops, but it is important that the Holland Lop breeder thoroughly understands the dwarf gene. The breeds that carry the dwarf gene are the Holland Lop, Netherland Dwarf, Mini Rex, Mini Satin, Dwarf Hotot, Polish, Britannia Petite, American Fuzzy Lop, and Jersey Wooly. With regard to the dwarf gene, Holland lops come in three types: true dwarfs, false dwarfs, and peanuts. Peanuts do not grow and always die, usually within a few days, but occasionally last a week or two. False dwarfs are also called “normals” and can make good brood animals. 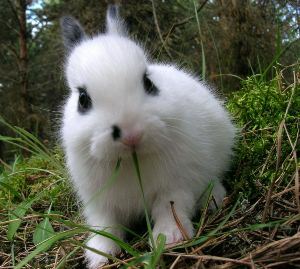 Show rabbits are typically true dwarfs. False dwarfs are more likely to be long, have longer ears and back feet, and often exceed four pounds in adulthood. These are tendencies and not absolute proof of being a false dwarf. The rabbits that most often do well on the show table are true dwarfs. They tend to be truer to type–shorter, with shorter ears and back feet, more balanced, and more likely to fall within the allowable show weight range of two to four pounds. The rabbit on the left is a true dwarf. It has a much rounder head and shorter body type. It weighs under 4 pounds. The rabbit on the right is a false dwarf. Due to its large size (over 4 pounds) and lengthy body type, it will not win at shows, but it will also not produce peanuts. 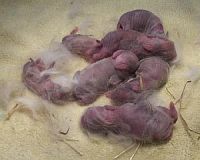 How do you tell if your newborn rabbits are peanuts? You will recognize peanuts in your litter by several characteristics. First, at birth peanuts weigh about 3/4 of an ounce, whereas other kits weigh about 1 1/2 ounces or more (the two newborn bunnies to the far left in the picture are peanuts). Peanuts may have bulging skulls with ears that are set further back. Also their hips are often underdeveloped and their back legs may cross. Since the peanuts will die anyway (they lack growth tissue so they never develop), some breeders remove them from the kindling box as birth. Others allow them to remain with the litter until they die a natural death. But either way, peanuts are ultimately a non-issue on your quest for ideal true dwarf Holland lops. So how do you breed for true dwarfs? You might be tempted to think that breeding a true dwarf to a true dwarf would yield a litter of true dwarfs. But that’s not how it works. First, we need to know that a true dwarf has one true dwarf gene (or just “dwarf gene”) and one false dwarf (or “normal gene”). A false dwarf has two normal genes and a peanut has two dwarf genes. If you breed two true dwarfs together, on the average, one of four would be peanuts, two of four (or 1/2) would be true dwarfs, and one of four would be false dwarfs. Since the peanuts will certainly die, two out of three of the surviving kits would be true dwarfs and one out of three would be false dwarfs. Remember, these numbers are averages. Your actual results will vary. If you breed a false dwarf with a true dwarf (and it doesn’t matter whether the doe or the buck is the false dwarf), you have the following results on the average: two of four (or 1/2) will be true dwarfs and two of four (or 1/2) will be false dwarfs. Notice there are no peanuts in these litters. The only way to produce peanuts is by breeding two true dwarfs. Let’s see what happens when you breed two false dwarfs. You can easily predict that if both parents have only normal genes to pass to their offspring, all of the offspring will have only normal genes. And that is exactly what we get, a whole litter of normals or false dwarfs. Now what does all of this mean for your breeding program? First, if you are breeding toward the standards and looking to successfully show your rabbits, at least one parent should be a true dwarf. But it is clearly obvious that you do not need to have both parents to be true dwarfs to produce a true dwarf. In my barn, I sometimes breed true dwarfs together, even though I know 1/4 of the litter, on the average, will die. If the two rabbits complement each other and it is a good pairing otherwise, I breed the true dwarfs. The counterbalancing of strengths and weaknesses is the most important factor. Producing or not producing peanuts is secondary. Most often, though, I breed a true dwarf buck to a false dwarf doe. I think that a false dwarf doe has an easier time kindling and caring for her young, especially if the kits are larger or there are many of them. False dwarfs seem to maintain their weight better and are prepared to kindle again sooner. I’d love to hear from other breeders about their experiences with false dwarf versus true dwarf does. Do you see a difference as well? In any case, with these pairings, no peanuts are produced. Sometimes I breed a false dwarf buck with a true dwarf doe. I have heard cautions that the kits may be too big for the doe to kindle, but I have not had that experience. Remember, even if you breed two true dwarfs together, you will have some false dwarf kits. The resulting offspring have the same number of true dwarfs and false dwarfs as in a litter from a true dwarf buck and a false dwarf doe. I have bred two false dwarfs together in hopes of producing brood does (brood bucks are part of the package, but not the goal in this case). I would choose this type of breeding very rarely. In one case, for example, I wanted to combine the genes from two lines of which I only had false dwarfs. I got three does to choose from and was very happy with the results (the picture is of the whole litter of false dwarfs). But that is definitely a two-generation plan. The resulting brood does can now be bred to true dwarf bucks with the hopes of producing some show quality Holland Lops. If you wonder whether your rabbit is a true or false dwarf, breed it to a known true dwarf. If there are peanuts in the resulting litter, your rabbit is definitely a true dwarf. If not, it is probably a false dwarf, though with a small number of offspring, the conclusion is not totally reliable. 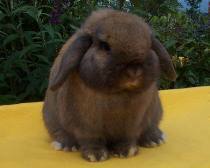 With repeated breedings to true dwarfs with no peanuts, you can safely conclude that your Holland Lop is a false dwarf. By the way, weight alone cannot determine a false dwarf. I have had a true dwarf buck who is over four pounds (pictured), but regularly throws peanuts with true dwarf does. And I have a false dwarf buck just under four pounds. Should you show or register false dwarf rabbits? This doe is a false dwarf that was registered right at six months, before she went overweight. You may wonder why you have seen false dwarfs on the show table and whether they ever win. I do show my false dwarfs when they are young, hoping to get a thorough opinion of my Holland Lop. If I am going to use the rabbit in my breeding program, I’d like to hear about his or her strong points and other weak points (besides the extra length) to help me make a better breeding decision. Sometimes, especially in the junior classes, a false dwarf will win the class. 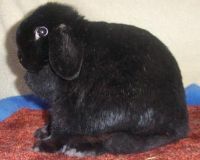 It is unlikely, however, that the false dwarf Holland Lop will have a long or very successful show career since false dwarfs generally weigh above four pounds in mature adulthood. This point brings up another issue. If you want to register your false dwarf Holland Lop, you should do so as soon after the rabbit turns six months old as possible (the doe pictured at the right was exactly 4 pounds when registered–at the very next show she was DQed for being over the weight limit). Once your rabbit exceeds four pounds, it is extremely difficult, if not impossible, to return him or her to four pounds and maintain the rabbit’s health. Even though the false dwarf is unlikely to Grand, you may want the registration to show up on its offsprings’ pedigrees, possibly earning that son, daughter or “grand-bunny” a red, red & white, or red, white & blue seal on its registration (see The Road to Grand Champion for more information about registering Holland Lops). If you have a false dwarf Holland Lop who is a grand champion, please let me know. As you cull your rabbits and decide which to keep, which to sell as show or breeding stock and which to sell as pets, remember that false dwarf bucks can be a valuable part of your own breeding plan. If, except for the extra length and size, a buck has numerous good qualities to pass on to his young, keep him or sell him as a brood buck. There is certainly no reason to automatically pet out a false dwarf buck. Also, buying a false dwarf buck may be a reasonably priced way to get a great set of genes into your breeding program. To sum up, when you breed two true dwarfs, your litter will contain true dwarfs, false dwarfs, and peanuts. If you breed a true dwarf to a false dwarf, you should expect about half to be true dwarfs and about half to be false dwarfs. If you breed two false dwarfs, you will get only false dwarfs. Peanuts always die and can only result from the breeding of two true dwarfs. Next article: more discussion of the dwarf gene and its implication in breeding Holland lops and other dwarf breeds.